I've just finished what has to be my favourite craft project yet and I'm so excited to share it here! I was contacted a while ago by Parcel Hero and asked if I would be interested in taking part in a craft project they were organising to raise money for Oxfam. They had an idea to create an advent calendar by sending out 24 plain wooden boxes to craft bloggers around the world and asking them to decorate them and place a handmade gift inside. The advent calendar will then be auctioned off on eBay and will hopefully raise a tidy sum for the charity. I thought the idea was just wonderful and was thrilled to be asked to take part. 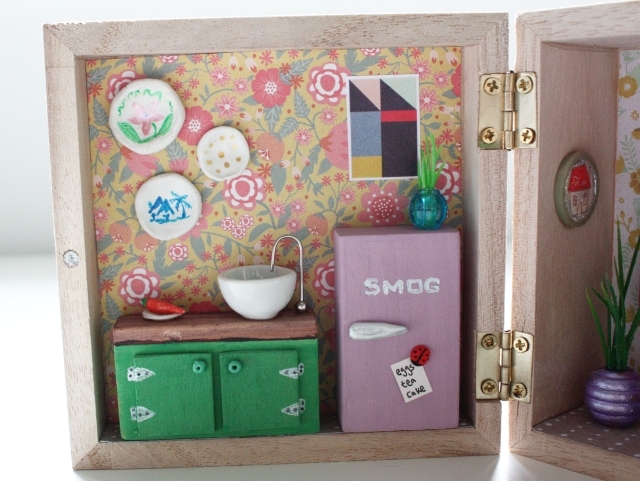 I spent ages agonising over how I might decorate the box and more importantly - what I might put inside it. 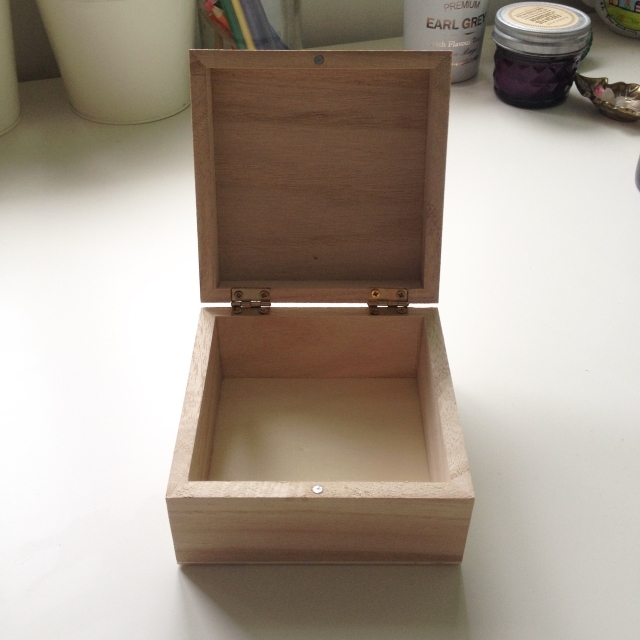 The boxes are quite small - at just 11cm x 11cm - so whatever I made would have to be pretty mini. 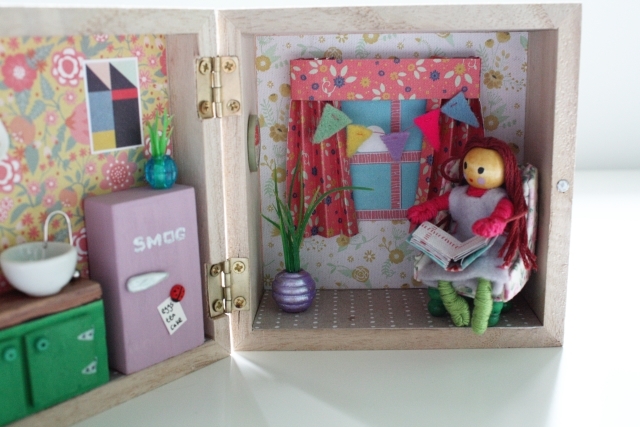 At first I thought I might make a small toy to place inside the box. Maybe a miniature version of my felt unicorn or a set of peg-dollies but then I decided to think 'outside the box' (if you'll pardon the most obvious pun in the world!) and see if I could make something a little bit different. 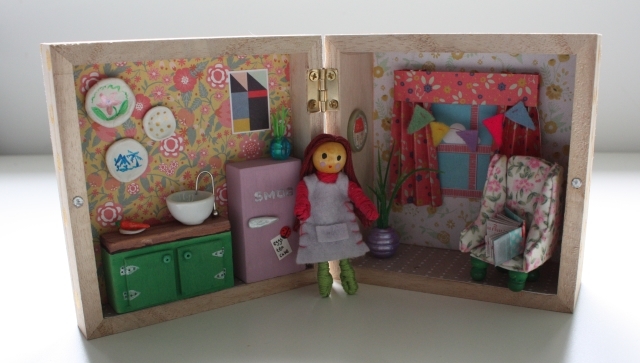 As regular readers may have noticed - I have a bit of a thing for miniatures and a love of dollhouses (see here, here and here for examples) so it didn't take me long to reach the decision to turn the box into a tiny, portable dollhouse! The only trouble was - none of the miniature things you can buy, or that I had here at home were tiny enough to fit the box. The scale was so small that I knew I would have to make everything from scratch. I started with the kitchen. The sink unit and fridge are made from two small wooden blocks from Lile and Sábha's brick box - painted and decorated. The sink is a tiny porcelain bowl from a very small tea-set I own and the tap is made from a bit of a paperclip and a silver bead from an earring (that'll give you an idea of how small this thing is!). The little plate is a button and I sculpted the carrot, the ladybird fridge magnet, the fridge handle and the wall-hanging plates from air drying clay, which I then painted. I picked up a packet of scrapbook paper in the Art and Hobby Shop. It has a lovely quality feel to it and the most gorgeous colours and designs. I used this paper to cover the walls, the floors and to make the window and curtains in the 'living room'. The bunting is made from the tiniest scraps of felt and a bit of thread. The plants are beads and a few snips of fake 'seaweed' left over from my mermaid small world project. I made the book and the chair by following, adapting (and scaling down massively!) some YouTube tutorials. (Here are the links for the book tutorial and the chair tutorial I based my pieces on). Last but not least is the resident dolly herself. 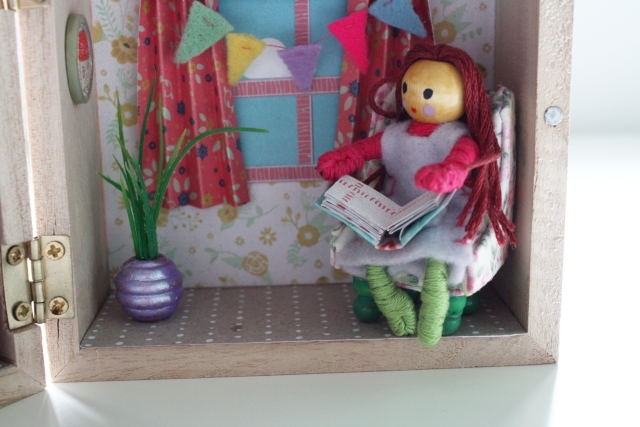 I made her in the same way as I made my mermaid dolls but gave her legs and clothes rather than a tail obviously! I'm very pleased with how she turned out and I think she looks very happy in her home. After I had painstakingly completed the interior details (it took at least 8 hours!) I had only to decorate the outside of the box. 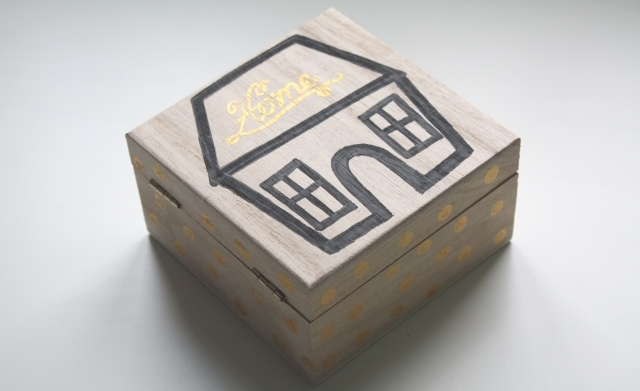 For contrast, I kept it very simple, stamping gold polka dots on the sides and painting a simple house in black acrylic. 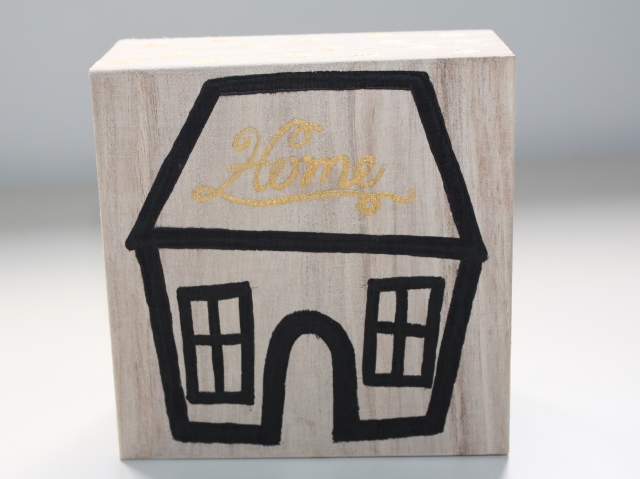 I enlisted Devo, who has an amazing talent for hand-lettering, to paint the word HOME on the roof. You can have a peep at a few of the other boxes HERE and get an idea of how amazing the whole advent calendar will be. I think it'll be a truly special thing. You can follow the progress of the advent calendar on the Parcel Hero Blog or on twitter @ParcelHero and keep an eye out for the auction if you'd like to make a bid! Wow, that is absolutely gorgeous. Whoever gets that will be so happy! That's just incredible - you are one talented woman. Seriously - that's amazing. Well done!